Here in the west we largely consider history to be ‘the facts.’ Sure there are the more liberally minded that concede that history is written by the victors and that voices like Howard Zinn (and others) capture more nuanced truths about history. Believe me, we need Howard Zinn’s in this world and his academic ancestors too. The recently deceased historian Hayden White made a case that all history is a kind of fiction. He coined the term ’emplotment’ along the arc of his career while making the case that history is a very much alive being that needs tending to. White wrote: “Both science and art have transcended the older, stable conceptions of the world which required that they render a literal copy of a presumably static reality,’ he wished for historians to do the same and recognize that deciding to tell a story starting at a specific point and with a specific end makes your telling one facet of a larger glamour. So in telling the story of a dry stack stone wall built in a backyard in Harlem, where do you begin? Do you start with tectonic plates and volcanic activity? Or the small, now underground, estuary to the Hudson River that rounded the stones over tens of thousands of years? Or do you start with the mortarless stone walls of England, Ireland, and Scotland? Or the ones in New England? Or with the agricultural revolution that wanted stones out of the ground en masse so they could run ploughs? Or with the man who built this beauty? Any one of them would do and we have to tell one thread of a deep braid of a woven story for now. The oldest dry stone walls (stones stacked into a wall formation without any mortar or cement) in Europe are at Skara Brae in the Orkneys and are nearly four thousand years old. Canada, Iceland, Norway, Sweden, France, Germany, Spain, Italy, Croatia, Czech Republic, and Zimbabwe all have rich dry stone walling histories. And Belize too as well as Peru where the Inca built Machu Pichu with dry stone construction. Old indeed. But those Orkney hands that made them must have had ancestors that learned well because as intensive agriculture flourished in Europe dry stone walls did too. These stones were often called ‘devil’s seed’ because they were unending trouble to deal with…plough them out one season and there are just as many the following year. And they slowed everything down. But after a few years of carrying these stones to the edge of field suddenly an accidentally border and barrier was made. And those borders were fashioned into something quite beautiful and durable and spoke deeply to the relationship being forged with the land. These kinds of walls were sometimes called ‘stone cribs’ – where you put your rocks to sleep. 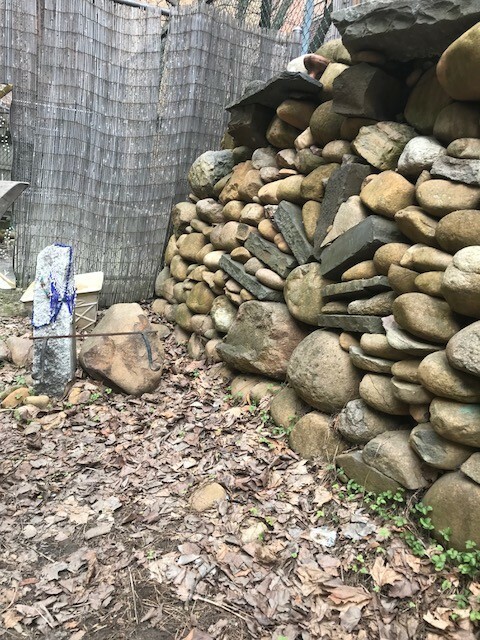 While I can tell you more about the history of dry stone walls…my wall came about after years of digging stones out of my backyard. And I had a pile at the back too – just like all those actual farmers. When I found James Asbury he was a younger man but still well experienced with making dry stone walls. New York City was far from his home so he and I courted an older path of work. I put him up in my home and fed him for a few weeks while he built the wall in the backyard. Normally when you consider the vision of a physically strong man you consider the bulk of the man. His girth and mass seems to be the measure. But I’d implore you to consider clear spirits – gin, vodka, moonshine whiskey. Those distillations are far stronger and far less than what it was derived from. James Asbury is such a kind of distillation. Absolutely human sized and unremarkable in scale but shockingly strong and with a determined good will that matches his capacity to make beauty out of stone. When he was done with the wall he said “Save a major flood or some kind of direct impact on the wall this should be here for a couple millennia.” It isn’t often that you can get a guarantee like that. But James had suddenly linked up my backyard stone wall with every other long lived wall in other parts of the world. He even brought a stone from the last wall that he made to include in my wall and took one stone from my yard to take to the next. He said that this was an old tradition that connected all walls and made them a kind of kin. It is at this edge where our fingers are rubbed thin and grow back with a bit of wisdom that we actually start to develop some human making skills. If you need a drystone wall I’d urge you to call on James at Mountaineer Stone and maybe follow some of your blisters too. These long and old traditions that are fed with care and consideration is what Primal Derma is all about. We try to do with skincare what James does with stones and walls – court the old ways. If you need some skincare in your days…we’d love to send it to you.